Share More than ever, our clothes are made of plastic. Just washing them can pollute the oceans. Polyester, nylon, acrylic, and other synthetic fibers — all of which are forms of plastic — are now about 60 percent of the material that makes up our clothes worldwide. Synthetic plastic fibers are cheap and extremely versatile, providing for stretch and breathability in athleisure, and warmth and sturdiness in winter clothes. 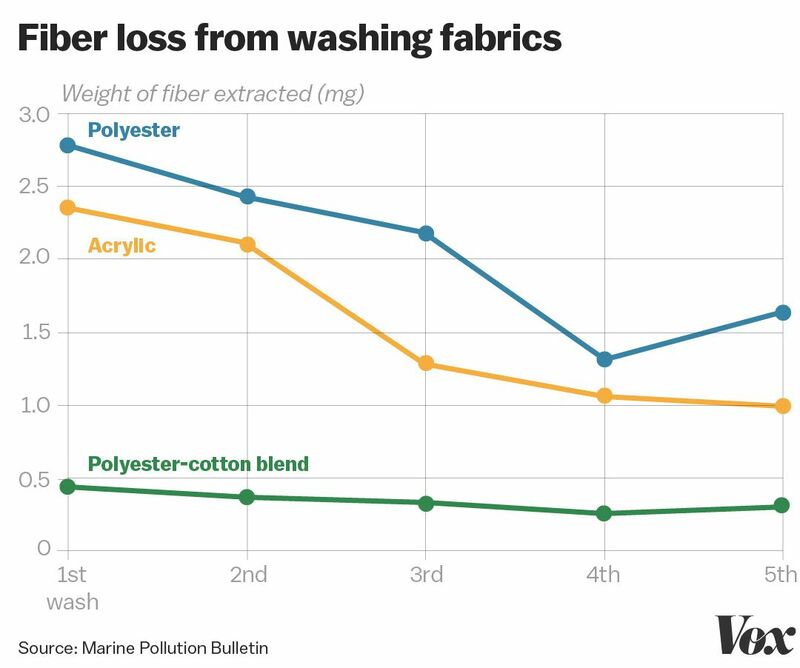 These fibers contribute to ocean plastic pollution in a subtle but pervasive way: The fabrics they make — along with synthetic-natural blends — leach into the environment just by being washed. 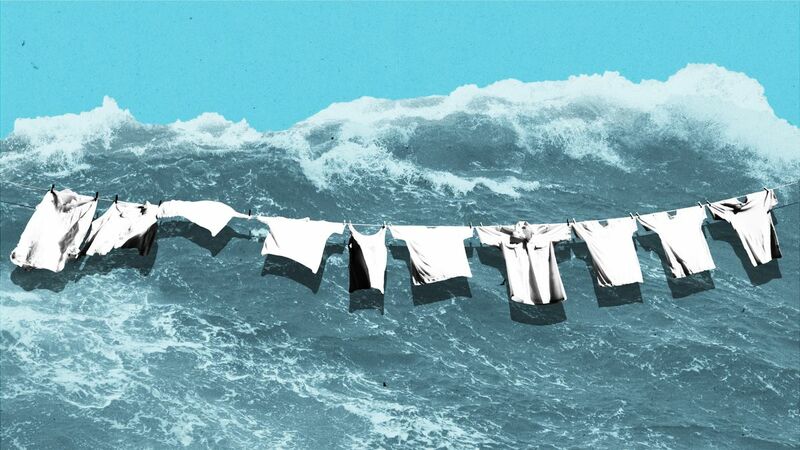 Estimates vary, but it’s possible that a single load of laundry could release hundreds of thousands of fibers from our clothes into the water supply. And these tiny fibers — less than 5 millimeters in length, with diameters measured in micrometers (one-thousandth of a millimeter) — can eventually reach the ocean. There, they’re adding to the microplastic pollution that’s accumulating in the food chain and being ingested by all sorts of marine wildlife, and even us. Most of the plastic that’s in the ocean, in terms of number of pieces, is not in the form of whole products like cups or straws, but instead broken-down shreds of plastic. Worldwide, there are now vigorous efforts to reduce the use of some of the products that end up in the oceans, like plastic cups and shopping bags. (Perhaps you’ve heard of plastic straw bans.) As we seek solutions to the overall issue of plastic pollution, we need to recognize that our clothing is a major part of the problem and will need to be part of the solution as well. Consider the lint you collect in the dryer. That lint is tiny bits of thread from your clothing that have become dislodged and are caught by a mesh screen. Similarly, synthetic fibers come off in the wash — but they’re so small, and there’s no filter inside the machines to catch them. Instead, these tiny plastic fibers pass through to sewage treatment plants, which often don’t have filters fine enough to catch them. (And if they do, the fibers may end up in another sewage byproduct: fertilizer.) Treated wastewater is then often dumped into rivers or the sea, carrying plastic clothing fibers with it, as a 2011 study found. 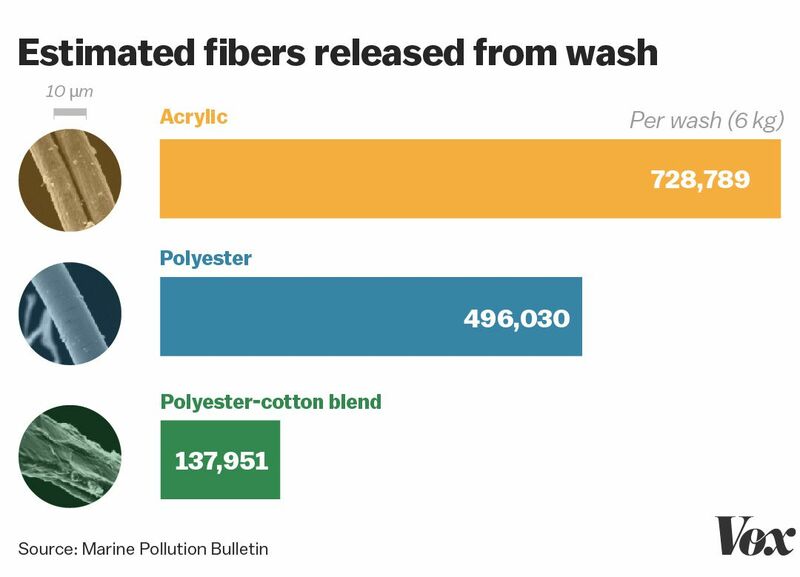 In 2016, Napper and a colleague designed a test to see how many of these fibers could be shed in the wash. They fitted a Whirlpool front-loading washing machine with a special filter to collect tiny fibers. They tested swatches of three types of fabric: a polyester-cotton blend T-shirt, a polyester hoodie, and an acrylic sweater. After a few washes (all garments shed more when they are brand new), the acrylic fabric shed the most, followed by the polyester, and then the poly-cotton blend. “We found that in a typical wash, 700,000 fibers could come off,” Napper said. Other studies have come up with different estimates. 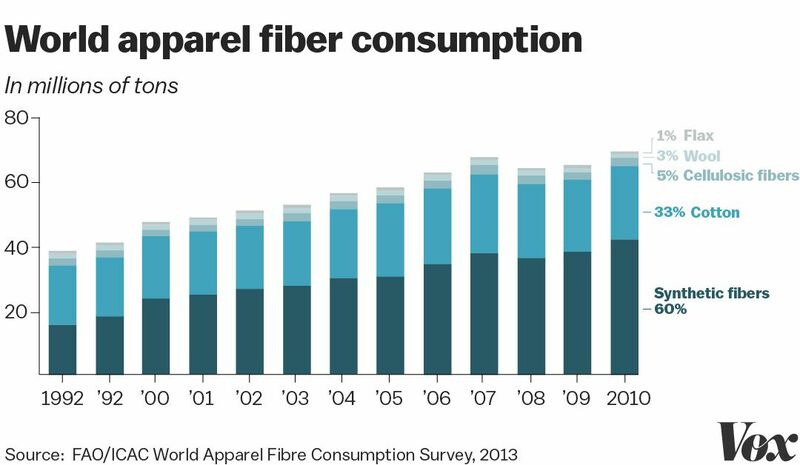 One 2011 paper found 1,900 fibers could be released from a single synthetic garment in a wash; another effort estimated 1 million fibers could be released from washing polyester fleece. It’s hard to pin down the exact amount of plastic pollution per load because there are so many variables that may contribute to fibers shedding or not: garment construction, materials used, water temperature, detergent type, fabric softener, how full the machine is, etc. One study found that top-loading washing machines releases seven times the microfibers as front loaders. And even if the amount of plastic shed per load is small, measured in milligrams, it adds up. A paper in Environmental Science and Technology estimated that “a population of 100,000 people would produce approximately 1.02 kilograms of fibers each day.” That’s 793 pounds per year of individual, teeny-tiny plastic shards. These tiny plastic particles can find their ways into the diets of marine life and accumulate throughout the food chain. Microplastics can be toxic to wildlife on their own, but they can also act like sponges, soaking up other toxins in the water. Worse, they can be ingested by all sorts of marine wildlife and accumulate in the food chain. A recent study found around 73 percent of fish caught at mid-ocean depths in the Northwest Atlantic had microplastic in their stomachs. Even the animals that live in the Mariana Trench, the deepest part of the ocean, are eating microfibers. Seemingly, wherever scientists look, they’re finding plastic fibers contaminating the environment. Often, plastic textile fibers are the dominant source of plastic pollution found in surveys. Plastic fibers have been found in the sediment surrounding beaches, in mangrove groves, and in Arctic ice — even in products we eat and drink. “The average person ingests over 5,800 particles of synthetic debris” a year, a recent paper in PLOS finds. And most of those particles are plastic fibers. It’s hard to say how much microplastics from textiles contributes to the overall plastic pollution problem in the ocean. Because microplastics are so tiny — and many of them end up deep in the ocean, or on the ocean floor — it’s hard to get an accurate census of them. That said, a 2017 International Union for Conservation of Nature report estimated about 35 percent of the microplastics that enter the ocean come via the synthetic textiles. It also underscored how this is a global problem: Synthetic textiles are more common in developing nations, which often don’t have robust wastewater treatment facilities to filter them out. And remember: Plastic can take hundreds of years, possibly millennia, to degrade. The plastic we throw into the ocean now will remain for generations. It might seem like there’s an easy solution to the problem of our clothes shedding plastic: Just buy natural fibers, or fewer clothes overall. But it shouldn’t be a luxury to be environmentally conscious. Often, synthetic clothing is affordable clothing. For a solution to be workable, it “needs to be accessible for everyone,” Napper says. Too often, an environmentally conscious consumer is an affluent consumer. We can’t expect everyone to go out and purchase stainless steel straws or all-glass water bottles. It’s a similarly class-deaf message to insist everyone need to be wearing all organic cotton, wool, or hemp clothes (and natural fabrics can strain the environment in other ways, like requiring huge amounts of water to produce). The solutions need to be more systemic. And they can start with our washing machines. “Washing machines need to be designed to reduce emissions of fibers to the environment; at the moment they are not,” says Mark Browne, a environmental scientist at University College Dublin who has found evidence of microfiber pollution coming from wastewater treatment plants. Currently, Napper is working on a project looking into whether fiber filters for washing machines are a feasible solution. Textile manufactures could also design fabrics that shed less, clothing companies could utilize them, and consumers could be more mindful.